I am EXHAUSTED. Today I went on my son's first big field trip to a local pumpkin patch. We've already been on our own...and you can see that post here. It was tons of fun. Sometimes I just love being around little kids. They're never stressed or worried; they're so ambitious and curious and often times very funny. When we, as adults, become over stressed with the smallest things in life, spending some time with a bunch of giggling 5 & 6 year olds can be almost therapeutic. But like I said, equally exhausting. I was begging my kids to let me take a nap this afternoon...but with an exploratory 14 month old, I had no such luck. 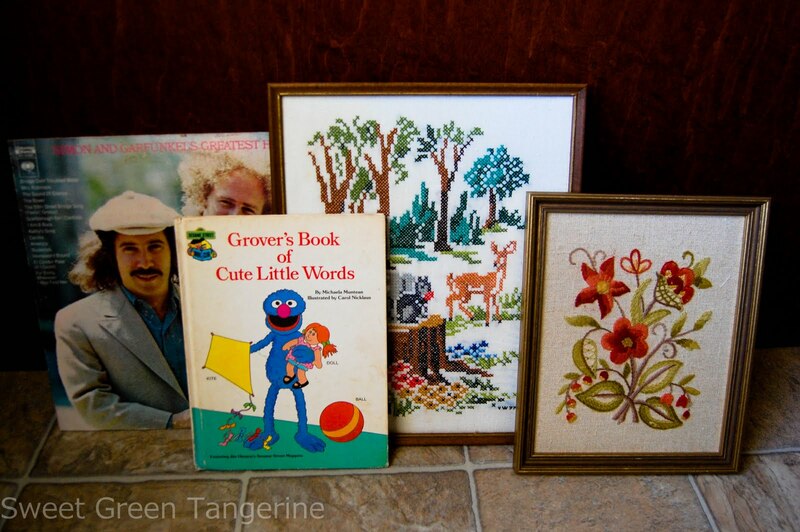 But anyway, I just thought I would share some of my recent thrift store purchases. I met up with a local thrifter (and blogger, see here). She's been here a lot longer than me, so she gave me some insider scoop on the best resale & antique shops around. So glad to have found someone who treasure hunts like me. And this is what I came home with. As I said in the title, I'm starting a few little collections. One of which is vintage pyrex. 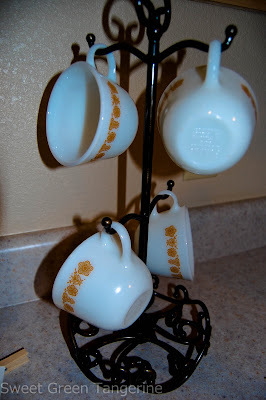 I thought these were super cute, and I don't know how old they are, but they remind me of my Grandma. I love the little butterflies on them. It cracks me up how small they are compared to our giant coffee cups now. I drink out of a Thirstbuster size coffee cup. I'm also starting a little record collection. I do not yet own a record player, but it's definitely on my list. I have always loved S&G and I actually have this album on CD, but I can't wait to hear on vinyl. And then there's the framed needlepoints. The forest scene looks precious in the baby's room & the flowers go perfectly in my craft room. I spent a whopping $6 on all of these. Score! looks like those will be some fun collections to work on! 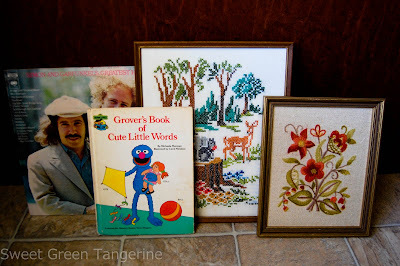 I especially like the framed needlepoints, if you end up with a bunch of them they could definitely make a cute and quirky gallery display.